Władziu (or Vladziu) Valentino Liberace (May 16, 1919 – February 4, 1987), best known as Liberace, was an American pianist and vocalist of Polish-Italian origin. Liberace's career lasted four decades. It included concerts, recordings, movies, television and endorsements. During the 1950s–1970s he was the highest-paid entertainer in the world. He lived a life of flamboyant excess both on and off the stage. The success of Liberace's syndicated television program made him a popular recording artist. From 1947-51, he released 10 albums. By 1954, it jumped to nearly 70. He released several recordings through Columbia Records, including Liberace by Candlelight. He sold over 400,000 albums by 1954. His most popular single was "Ave Maria", selling over 300,000 copies. His albums included popular songs at the time, such as "Hello, Dolly!". He also played his versions of classical music for the composed by Chopin and Liszt. Many fans of classical music criticized them (and Liberace's skills as a pianist in general) for being "pure fluff with minimal musicianship". In his life, he received six gold records. 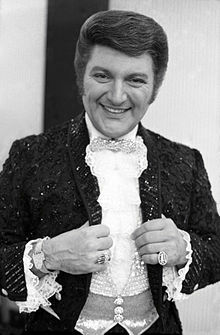 Liberace was born on May 16, 1919 in West Allis, Wisconsin. During his career, LIberace denied being homosexual. He successfully won lawsuits against The Daily Mirror newspaper and Confidential magazine, who had reported some of his gay relationships. He was awarded damages and legal fees. Towards the end of his life his chauffeur sued him for "palimony". That lawsuit did not win. He died of pneumonia caused by AIDS/HIV on February 4, 1987 in Palm Springs, California, aged 67. ↑ Pyron, 2000, p. 157. ↑ Pyron, 2000, p. 153.